Despite the sun and sand, this game didn’t really resemble anything from Copacabana in Rio early on, and at times this was more like watching the locals playing on Kinghorn beach, such was the lack of people there, the cold temperature and the rutted pitch. However, after a slow opening to the game that saw nearly 9 minutes of football before Paul Gallacher got his first touch, it was the Pars who were to have the better of the first half. The first incident of note saw Dunfermline awarded a free kick 25 yards out, but Scott Thomsons’s attempt was straight into the defensive wall and easily cleared. The only real Thistle chance of the first half came a couple of minutes later, as Damon Gray closed in on goal from the edge of the area, but the chance came to nothing as Greg Shields read it well to get in a good sliding block. As the middle of the first half approached, the wind became more noticeable, with a long Thistle free kick going up in the air and almost doing a U-turn before coming back down. However, thankfully minds soon became focussed on the football, as Stevie Crawford sent a shot past Tuffey in the Thistle goal and into the net in the 25th minute after a neat pass inside from his strike partner and manager. The goal was not to stand however, with the linesman flagging for offside. It appeared to be a tight but correct decision. This was immediately followed by another of the first half highlights, the sight of David Rowson losing his footing in the sand and falling flat on his face right in front of the Thistle fans, and the inevitable look of bemusement on his face. Upon picking up the ball in midfield from this, a good Pars move saw Crawford hit a shot at goal from the right hand side of goal that Tuffey did well to parry. With the rebound falling to Nicky Phinn just 8 yards out and the keeper on the ground, it appeared that the Pars would open the scoring, but with the ball coming quickly and at an awkward height, the ball ended up being sent high over the empty goal. With half an hour gone, Partick again threatened, with Damon Gray again the man involved. Picking up the ball 25 yards out, the shot was firmly struck, but just a few feet over Gallacher’s top left corner. 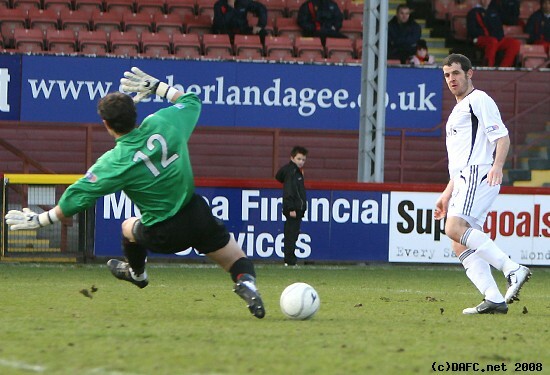 A few minutes later and it was the Pars attacking again and another missed chance, this time the ball falling to Scott Thomson to fire over from close range after Stephen Glass’ corner was flicked on by Wilson and neatly played through by Crawford. As the clocked showed half time approaching, Dunfermline were playing briefly with 10 men, before the substitution of Simmons for Shields could be made. In truth Shields had looked to be struggling for most of the half, and it wasn’t a great surprise to see him taken off. Almost immediately after the substitution, the Pars finally scored the goal that gave an accurate reflection of the first half’s play. With a clock showing bang on 45 minutes, McIntyre found some space on the left side, and saw the run of Crawford on his right. There was no question of offside this time with a dosy defence simply not having picked up the run - being faced with only the Tuffey to beat, the Pars striker calmly passed the ball beyond the keeper and in to give the Pars a half time lead.